When you start a reading comp passage, you’re reading for the central argument, or what our curriculum/books like to call “the scale.” On easier passages, the two sides are laid out for you immediately. For example, in the Reader Response Theory passage—PrepTest 43, Passage 3—the two sides of the argument (RR Theory on one hand and Formalism on the other) are given to us in the first paragraph. As a result, few students in our courses have trouble identifying the two sides of the scale. In more difficult passages, however, the central issue doesn’t appear until later—maybe at the end of the first paragraph, or even in the second. In PrepTest 27, Passage 1 on jury impartiality, for example, the real issue doesn’t come up until the end of the last paragraph. If you’re presented with two conflicting views in the first sentence, odds are that they’re the two sides of the argument, but they might not be. If they passage changes direction and starts discussing something else, you need to be able to adjust. The key is to be flexible. Don’t assume that whatever central argument you spot in the first sentence or paragraph is absolutely what the passage is about. In the PrepTest 27 passage I mentioned above, the one about jury impartiality, the way to identify the true scale (which again, appears at the very end of the passage) is to realize that’s where the author gives us a solid opinion. Because the opinion isn’t what we expect, we have to shift our scale. Only when you have a full picture of how the author views what he/she is discussing can you feel confident that the central argument you’ve identified is correct. 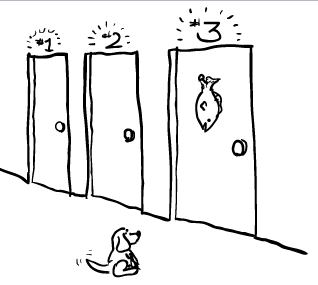 Many LSAT takers find the Logic Games section of the exam to be the most challenging. Why? It’s because “Analytical Reasoning” (aka Logic Games) is the section of the test that is most unique to the LSAT. Sure, maybe you’ve done a few logic riddles or Sudoku puzzles in your free time, but outside of the Manhattan LSAT geek squad, I know very few people who spend time solving Logic Games ‘just for fun’. Mastering this unfamiliar section of the exam requires a lot of time and practice, but there’s good news: Logic Games are extremely learnable! With proper preparation, you can actually develop in to a good enough player of Logic Games to count on this section to boost your score. Binary Grouping: Is It or Isn’t it? So how does one get good at these things, aside from picking up some free nuggets of advice on our blog? While practicing as much as possible is important, it’s equally important to practice well. Pick up a book (I personally favor the Manhattan LSAT Strategy Guides, of course) and learn how to think about organizing the different elements that games are constantly throwing at you. Learning the proper strategy to practice will make the hard work that you put in to mastering Logic Games that much more effective. If games seem to be your main bugaboo heading in to October, consider signing up for the Free Trial Class for our upcoming Games Intensive Online Summer Course taught by, Brian Birdwell. 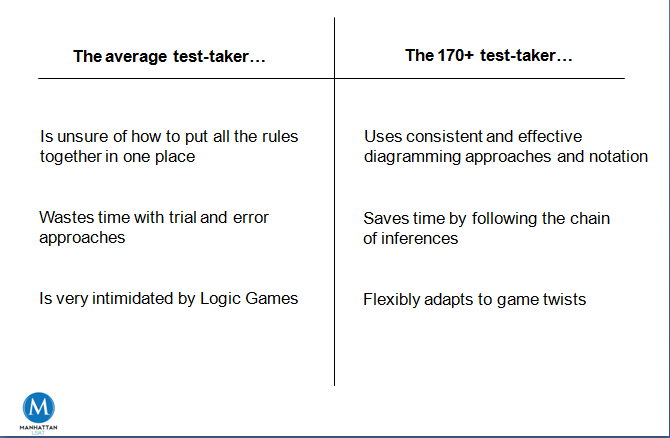 This class will focus exclusively on Logic Games and how a 170+ test taker goes about deconstructing them. For international law school applicants, the application process can be very complex. U.S. News Education shares two challenges international applicants may face and some helpful solutions to get you through the process. According to a study of all the American Bar Association accredited law schools, researchers ranked the schools based on their scholarly impacts of law faculty. The researchers looked at citations for the faculty that were given in legal literature over the past five years. 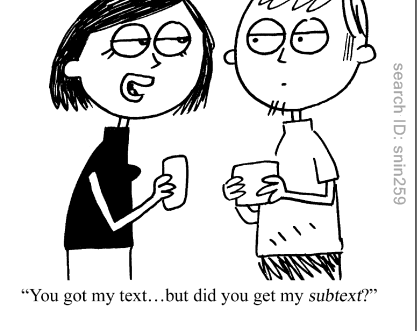 If you paid attention in literature class, happen to write plays in your spare time, or appreciate a good night of theater, you probably know what subtext is. Subtext means exactly what it sounds like: what’s underneath the text. It is not referring to what a character says but what a character (or author) doesn’t say. In fact, a play in which characters say exactly what they mean is generally considered a bad play, since human beings don’t work that way. Identifying sub-text gets you ‘A’s in college lit courses and trouble in relationships (“I know what you really meant when you said the apple wasn’t very crunchy!”). It also gets you in trouble on the LSAT. 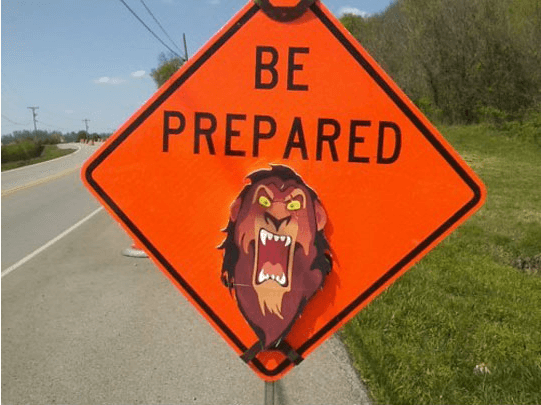 Everyone knows that test day will inevitably be a stressful and hectic event, but you can minimize the madness by being prepared for even the strangest of LSAT happenings. 1. DO read the LSAT test day rules.Then re-read them. Then re-read them again. Then commit them to memory as though they are the Gettysburg Address and you are Lincoln and the fate of the country literally depends on you knowing this thing word for word. Our Friday post is normally a compilation of text-based articles pertaining to the LSAT, law school, or the legal profession. This week, however, we are switching things up and sharing some of our favorite law-related You Tube videos. We’re normally pretty procrastination-averse, which is why we apologize in advance for any time wasted on the below videos. Please don’t be like this guy once you start law school. If I had a dollar for every time I heard, “Reading comprehension isn’t really something I can improve on much, right?” I would probably have cable. 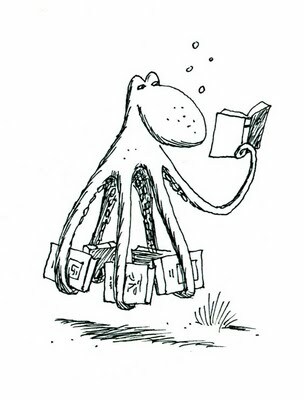 Unlike octopuses, humans are perfectly capable of acquiring and improving literacy! When I start working with a new student, one of the first things I tell him or her is that the LSAT is a very learnable test. It’s not an opaque and mysterious arbiter of natural intelligence, nor is it an unpredictable obstacle course for which no one truly knows how to prepare. Sure, the LSAT isn’t easy, but it tests real skills that can be improved upon through hard work. Usually, after our first logic games lesson, students get what I mean. They are, by learning the test, learning that the test is learnable. But when we begin to discuss reading comprehension, spirits fall. Someone who is missing 40% of the questions on reading comp thinks she’s doomed to do the same on test day. Take a break from studying to catch up on a few of this week’s top articles! Jobs & Hire has some great tips to keep in mind if you’re trying to find the right law school for you. Read up on why law students and lawyers are a privileged group of people. Happy Go Legal shares a hopeful perspective on legal education and the law profession and provides some interesting statistics. Yale Law School has announced a program for a Ph.D. in Law, which it claims is the first in the nation, and is designed to prepare students who have earned a J.D. to enter careers in legal scholarship. 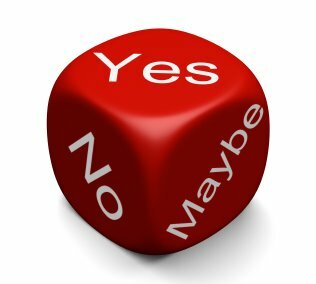 Don't just role the dice. Consider your situation and make a smart decision about when to start prepping. Now that June LSAT scores are in, there are a number of you who are planning to re-take the test in October. It’s almost the middle of July, and you’re asking yourself when you need to resume studying—now? August? September? It depends on how prepared you were for June. Which category do you fall into? 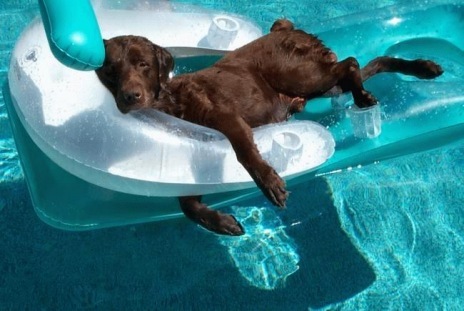 “It’s summertime, and the livin’ is easy.” This blissful lyric may ring true for some lucky folk, but for anyone gearing up for the October LSATand working tobalance a summer internship, a weekend job, and a social life, the summertime can be an extremely overwhelming and stressful time of year. As much as we love to embrace the warm weather, the shining sun, and the weekend festivities, it is undeniable that these distractions only dampen our focus and motivation to hit the books and master those daunting logic games. What is also undeniable is the fact that the October LSAT is less than three months away, which means that it’s time to toss the excuses and start cracking down. To get you on track, we have compiled some useful tips to help you stay focused through the summer and up until test day. Start Early: Personal trainers often tell their clients to hit the gym first thing in the morning so that there are no excuses to blow off working out later in the day. Take this advice and apply it to your studies. If you know that your energy dips in the afternoon or evening or that your group of friends likes to get together at night, schedule your study time early in the day.